Published on April 6, 2010 in Bands/Artists, In The Bins, Music, Out and About, Personal History and Vinyl. 0 Comments Tags: Ben Harper, Bob Seger, Booker T. and the MG's, Bruce Springsteen, Bumps, Chris Corsale, Cougar, Dangtrippers, Fleetwood Mac, Half-Price Books, In The Bins, Laurie's Planet of Sound, Live, Love Tractor, Men at Work, mp3 download, Prince, R.E.M., Record Dugout, Stax, Talking Heads, The Right Now, The Time, This Must Be The Place, Tortoise, Wilson Pickett. Last weekend Sherry attended America’s Beauty Show for the third year running and I got the opportunity to have some quality time with Chicago’s record stores. Friday night we went down to a bar called This Must Be The Place in Lemont, IL to see Chicago R&B phenom The Right Now. We got into town late, so we needed to scoot to try and get there in time to get something to eat. Thankfully the folks there were very accommodating and the food was excellent! The show was a lot of fun– it was the first time I’d seen the band since they played Mahoney’s in Cedar Rapids in 2008 as Eli Jones. The band has come a long way in their stage show. 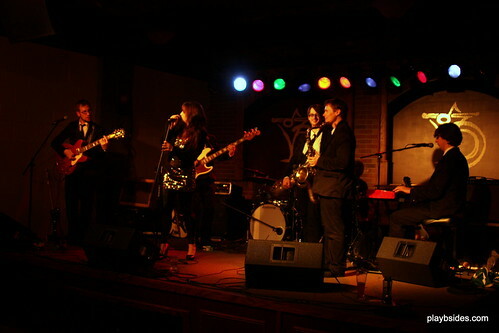 Now the guys in the band all wear matching suits and Steph looked great in a sequined dress and heels. This was the first time the band had played This Must Be The Place and there was a pretty low turnout. Some of the dinner crowd stuck around through the first set but by the second set the audience was made up of Sherry and I and the employees of the bar. The band followed a setlist for the first set, but after the break they decided to loosen up a bit and played some older songs like “Candlelight and Satin Sheets” and “Disco Smooth” and a couple of newly-written songs. I talked to the soundguy at the break a bit, and he said that the owner of the bar is trying to establish This Must Be The Place as a place for musicians to meet– sort of like The Green Mill or the Empty Bottle downtown. It is a lofty goal for sure as Lemont is about 45 minutes south of the Loop on I-55, and I think that getting the bands to come out of the Loop is a tough proposition. That said, the Metra runs down there so it isn’t an impossibility. It is a really nice venue with a great soundsystem and stage and the food and drinks are good. I’d come back if there was a good band there. We got to hang out and talk to the band after the show– I was happy that Sherry got to meet them, and we talked a bit about the upcoming Iowa shows the weekend of 4/16 (Iowa City, Davenport and Cedar Rapids). On Saturday, Sherry attended the first day of the conference at McCormick which started around Noon and I parked in the first floor lobby and worked on blog stuff. On Sunday she went to the second day of the conference and I decided I wanted to hit a Half-Price Books as I had the 50% Off One Item coupon. There are a few Half-Price Books in the Chicagoland area, but all of them are way out in the burbs. The closest one to McCormick Place was down in Countryside, IL off I-55 (pretty close to Lemont, really). So, I dropped Sherry off and hit I-55– it’s exit is right near McCormick Place. Men At Work – Business As Usual (LP, CBS Records, FC 37978, 1982)($0.50) This was clearance-priced, and has a VG cover and vinyl. Fairly quiet on the turntable after I cleaned it. I listened to this and Cargoa lot in junior high school. Three pretty big singles in “Who Can It Be Now?”, “Down Under,” and “Be Good Johnny.” It was their appearance at the US Festival on “New Wave Day” that really helped establish the band and make them the MTV darlings. This album is strong all the way through– the singles are scattered throughout the record and serve as familiar landmarks through the rest of the songs. Men at Work were often considered a band that copied The Police– and quite a bit of this album with it’s bouncy ska rhythms and jazz influences certainly supports that idea. One of my favorite non-single tracks is “Helpless Automation” which recalls a new-wavy Devo. I included this song in a mixtape that I played all the time in High School. I need to get Cargo, next. The Time – Ice Cream Castles (LP, Warner Bros. Records, 25109-1, 1984)($2.98) This is a title I don’t see very often (though, coincidentally would see again on Monday…). The story goes that Prince was trying to transition from the pop-funk sound that he established leading up to Controversyand apparently had a lot of music he still wanted to release in that vein. He puts his childhood friend Morris Day in front of a Minneapolis funk band called Flyte Time and creates The Time– on record, at least was mostly Prince and Day. By the time Ice Cream Castles is released in 1984, Terry Lewis and Jimmy Jam had been fired by Prince for missing a show and Morris Day quit to pursue an acting career propelled by his appearance in Purple Rain. Although the album cover shows the post-Lewis and Jam version of the band– which has a shockingly-young St. Paul Peterson on the cover. If his birthdate in October of 1964 is correct, St. Paul was 18 when he played in the Time. He wasn’t on the album, however and only apparently played two live gigs in the Twin Cities and he appears in the movie Purple Rain. After Morris Day leaves The Time, Prince gathers the remaining members and his then-girlfriend Susannah Melvoin and creates The Family. The Family are re-united as F Deluxe (Prince denies them the use of the name The Family– apparently still bitter about St. Paul leaving the group). Ice Cream Castles has what amounts to the biggest songs from The Time– “The Bird” and “Jungleland” which are both featured prominently in the Purple Rain movie. The production is credited to “The Starr Company” which is effectively Prince, who sometimes used the alias “Jamie Starr.” The original album inner sleeve is black plastic, interestingly. My plan was to hit another Half Price Books and spend my 50% coupon, but the next closest one was another 35 miles away. I did a quick Google Maps search for nearby record stores and found one called The Record Dugout(6055 West 63rd Street, Chicago, IL 60638-4317). 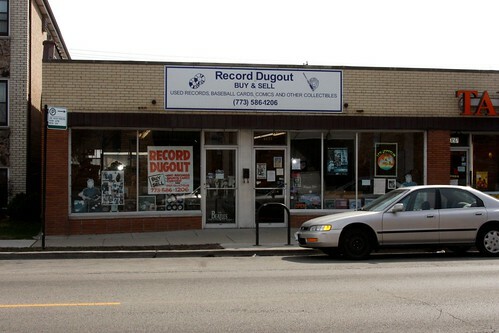 The Record Dugout is technically in Chicago– although really far south in Chicago. It’s a moderately-sized store that specializes in vinyl LP’s dating up to the 80’s, comic books and sports cards. The day I was there, the guy who handles the vinyl part of the store was working. His name is Bob Miner and he hosts an acapella radio show on The University of Chicago radio station WHPK which airs on Sunday evenings and is called “From the Subway to the Streetcorner.” The store was literally packed with vinyl. There was one row of sorted Rock in record bins, another shorter row for Jazz and folk/country, another “discount bin” with $1-$2 records, and a meticulously-organized bin with 7″ records– the majority of which was R&B from the 50’s/60’s/70’s. Other areas included a “Wall of Shame” as Bob called it, which showcased the more expensive records– rare 7″es with sleeves, etc., a table which had unsorted piles of cheap records in varying degrees of shape– most of which had damaged sleeves, but had serviceable records in them, and two areas on the floor which had $1 and $2 records piled up. I found most of the haul below in the sorted bins, but the ones for $1 and $2 I found by digging. Bob buys whole collections of records from people looking to get rid of them, so if he hasn’t gotten through them, the good stuff might not be in the bins. Everything seemed to have prices, however. It’s important to note that The Record Dugout only takes cash and the nearest ATMs charge fees, so bring cash. Also, if you buy a lot of stuff, Bob will work with you on price. I spent about three hours here, and probably could have spent more time. I’ll certainly come back! R.E.M. – Lifes Rich Pageant(LP, IRS Records, IRS-5783, 1986) ($4.00) I might have paid a bit too much for this one. The sleeve was not split, but kind of rough on the corners and the paper sleeve was replaced with another sleeve. The record is pretty clean, and after I gave it a thorough wipe with 91% Isopropyl Alcohol to get it cleaned, it sounds really good– the surface is a bit hazy, however. R.E.M. is tough to find in the bins, so I’ll pick these up when I find them. Lifes Rich Pageant was the follow-up to Fables of the Reconstruction, which was the album that pretty much changed my music listening. R.E.M. called this their “John Cougar Mellencamp album” because it was produced by Don Gehman at Mellencamp’s studio in Indiana. Classic R.E.M. sound on this one– “Begin the Begin,” “Hyena,” “Fall on Me,” “Superman,” “I Believe” are all strong tracks in the R.E.M. canon. The song “Just a Touch” was a song resurrected from the early days of the band and a number of bootleg recordings from the early 80’s have this song. Various – The Breakfast Club – The Original Motion Picture Soundtrack(LP, A&M Records, SP 5045, 1985)($2.00) Another one from the floor. Cover is in good condition and the record looks decent, but there seems to be a lot of groove wear on this one– particularly on “(Don’t You) Forget About Me” by Simple Minds. This was a soundtrack that my brother Steve and I listened to a lot– in fact, I think the cassette was actually his. My band in high school with Steve used to cover “(Don’t You) Forget About Me.” Fantastic drum beat in that song, which is why it is so timeless. It’s a kind of well-known story that Simple Minds didn’t write the song– it was penned by Keith Forsey who also wrote “Flashdance… What a Feeling” for Irene Kara. After being turned down by Billy Idol, Bryan Ferry and Simple Minds– it was encouraged by A&M that Simple Minds record the song. It becomes their biggest hit which help propel their career for a couple of albums. This soundtrack always struck me in how different it was to other John Hughes soundtracks in that while it had a huge single in “(Don’t You) Forget About Me,” it was really lacking in every other respect. I became familiar with the other songs by Wang Chung, E.G. Daily, Jesse Johnson, and Karla DeVito but aside from “Fire in the Twilight” from Wang Chung, which frankly sounds like an outtake from Points on the Curve, everything else seems like bargain-basement licensing– particularly if you compare it to the powerhouse soundtrack to Pretty in Pink, for example. The instrumentals by Forsey, while largely forgettable, work really well in the context of the movie. In the 80’s it really seemed like you couldn’t have a soundtrack to a teen movie that didn’t include songs by E.G. Daily. She contributed her unique vocals to movies like Better off Dead — where she performs her two songs in the movie, Summer School, Thief of Hearts as well as The Breakfast Club. She’s a pretty talented lady, and is a regular for voiceovers. It is she who voices Tommy Pickles in Rugrats, for example. Talking Heads – Speaking In Tongues (LP, Sire Records, 23883-1, 1983) ($2.00) Another one from the floor piles. The cover and inner sleeve are in tact, if a bit beat up. I have no Talking Heads on vinyl– well except for a bootleg called humorously enough Gimme Heads which has some studio outtakes and live tracks on it and a 12″ to “Blind.” After cleaning this one up, it plays pretty well, but I’ll be on the lookout for better copies. Last year’s Record Store Day had a Rhino reissue for 77— so I was hoping for some other reissues on vinyl. The Dugout also had True Stories on vinyl, but it was in pretty rough shape so I passed on it. Speaking In Tongues is pretty much the Talking Heads pinnacle release with the massive “Burning Down The House” single as well as secondary hits of “Girlfriend is Better,” and “Naive Melody.” Of course, these songs would show up in a bunch of movie soundtracks. I remember “Naive Melody” standing out in the soundtrack to Wall Street, and “Swamp” shows up in Risky Business. These tracks are featured prominently in the Talking Heads concert movie Stop Making Sensewhich was directed by Jonathan Demme. Fleetwood Mac – Mirage (LP, Warner Bros. Records, W1 23607, 1982)($3.00) Very clean vinyl– cover has a suspicious wear spot, like someone used water to take adhesive off the cover. Also a Columbia House pressing. Clearly I didn’t look very closely at this one. I don’t like to take Columbia House pressings normally due to the uncertain nature of what they used for masters. That said, it is very clean and plays well, and is one of the better copies of Mirage I’ve seen, even with those flaws. The Mac tries to come back from the Titanic expensive failure that was Tusk (still my favorite, however). I really like Mirage— the band comes back to the style and sound of Rumours. The album had six singles released worldwide, but the biggest singles were “Hold Me” and “Gypsy.” The album makes it to #1 on the US charts, so it is clear that their audience wanted another album, but in the canon of Fleetwood Mac, Mirage is not one that people remember. My first Fleetwood Mac concert was for the Miragetour in 1982. My family saw them in Cedar Falls with Glenn Frey of the Eagles opening on his first solo tour. I’ve seen Fleetwood Mac three more times since then– once during the very sad Time tour with Dave Mason and Bekka Bramlett on guitars and vocals in Dubuque, once for The Dance tour and once for the Say You Will Tour. Bruce Springsteen & The E Street Band – Live/1975-85(5 LP, Columbia Records 40558 LP, 1986)($15.00) This one was a cool find. I bought this new on cassette back in 1986– and still have it. I’ve seen it on CD over the years used, but never on LP. A great collection of Bruce live goodness from what most people would consider the high-point of his career. I think that they should do an official release of the legendary Winterland 1978 show. The version of “Santa Claus is Comin’ to Town” heard at Christmas time is from that show. This box set does, however, include the version of “Fire” from that show. The Winterland 1978 show had been bootlegged many times over the years– since it was aired live on the radio, lots of folks taped it. Wolfgang’s Vault helpfully has the show in their archives, but it is not one that is purchasable. Listen here. The vinyl on this box is pretty much pristine, even if the box itself isn’t. One I’ll want to kick back and listen to with a glass of wine some night. Booker T. & The MG’s – “Hip Hug-Her” b/w “Summertime”(7″ Stax 45-211, 1965)($4.00) I hadn’t really planned to pick up any 45’s, but they had a dedicated section just for Stax! So, I flipped through it and they had a few Booker T. & The MG’s singles. I picked this one because it was on the massively cool light blue Stax label. The record is in great shape for being 45 years old! Wilson Pickett – “Funky Broadway” b/w “I’m Sorry About That” (7″, Atlantic Records, 45-2430, 1967)($3.00) This one is one of the singles I really dig from Wilson Pickett– on the red Atlantic label. Super-clean and in an Atlantic paper sleeve. The Dangtrippers – “The Masquerade” b/w “Lover’s Again”(7″, Dog Gone Records, DOG 0005-7″, 1989)($3.50) Why is it that if I want to find rare Iowa bands in the bins I need to leave Iowa? The Dangtrippers were Doug Roberson of The Diplomats of Solid Sound’s 90’s band. I still remember seeing The Dangtrippers playing the Loras College gym when I went to school there. The band got signed to Dog Gone records which was the record label started by Jefferson Holt who was the manager for R.E.M. This is the single to the only album released for The Dangtrippers on Dog Gone before it went under (see below). “Lover’s Again” is a non-album b-side! The next day I dropped Sherry off at the conference again and I headed up to Lincoln Square to hit Laurie’s Planet of Sound, which I had hit back in October of 2007. The store was pretty quiet when I got there. They changed the parking meters to be able to take credit cards, which is convenient, but still really expensive. I blew $3 to get a couple of hours of parking. Laurie’s has a new arrivals section for their CD’s and LP’s and has a section dedicated to new vinyl as well. Their vinyl prices are higher than places like the dugout, but comparable to places like HPB which is attempting to charge market prices for some. Ben Harper and the Innocent Criminals – Burn to Shine(2 LP, Virgin Records America, 7243 8 48151 1 0, 1999)($9.99) This was in the new arrivals section and appears to be a cutout of sorts as the barcode is crossed out. Probably a promo or a giveaway, but is in great shape. I hadn’t really paid much attention to Ben Harper until I saw him as part of that 3D concert movie “Larger Than Life” back in December. I was impressed enough to pick up Harper’s new record White Lies for Dark Times on vinyl. Burn to Shine is considered to be one of his good releases so I thought it might be a good gamble. I gave it a spin when I got home, and it’s a good one for the collection. Bumps (2 LP, Stones Throw Records, STH2157, 2007)($12.99) This was a new purchase. Bumps is the side project of the Tortoise rhythm section of Bitney, McEntire & Herndon. This is a record of beats, essentially. 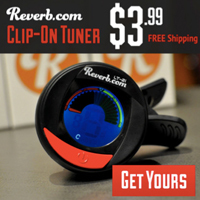 This is a really cool 2 LP version that was price cut from $15.99 to $12.99. This is mostly as a completion for my Tortoise vinyl collection, I don’t see myself playing this often. Cougar – Law (LP, Layered Music/Play It Again Sam, LR013, 2007/2008)($4.99) Although it isn’t really listed anywhere on the artwork and the LP itself only lists 4 tracks, this appears to be the full Lawalbum that was released in 2007 in the UK by Layered Music. Madison, WI band Cougar is classified as “emergency” music although I think they fit under the “post rock” area. Having your debut album mixed by John McEntire of Tortoise doesn’t hurt this classification either. The Dangtrippers – Days Between Stations (LP, Dog Gone, DOG 0005, 1989)($2.99) Wow! Another Dangtrippers find? The cover is a bit trashed on this one, but I didn’t know that this was even available on LP! I see on eBay there are a couple of LPs– one for $14.99 and one for $19.99, so $2.99 is a good deal. The vinyl is very clean. As I stated above, The Dangtrippers were a band from Iowa City from the 80’s and early 90’s that got signed to Dog Gone Records. They had this album out on Dog Gone before the label went under. Their second album Transparent Blue Illusionwhich came out in 1991 was only available on the Australian label Zero Hour. The Dangtrippers had a 60’s jangly rock sound that owed a lot to bands like The dB’s. In fact, the song “Talk About Love” on Days Between Stations sounds a lot like The dB’s and it’s pretty much my favorite track on the album. That song reminds me of a very bad trip to Florida in the early 90’s with my then-girlfriend to visit some friends of hers. The trip started out okay– it was Florida in late December and her friends had a gorgeous house with a pool and a Porsche 928 that was ours for the borrowing. We visited a mall that had a discount book store or something and I found Days Between Stations on CD there in the bins! The trip took a turn for the worst as she started giving me the silent treatment and wouldn’t talk about why she was upset. So, I was stuck in Florida with someone who clearly didn’t want to be there with me. We had a painful trip to Disney World followed by a really uncomfortable New Year’s Eve get together. By the time we flew back to Chicago to drive back to Dubuque I had enough of this ridiculous situation where she wasn’t talking to me about why she was upset. So, she was rewarded with four hours of “Talk About Love” on repeat in full volume. The relationship didn’t last much longer– she didn’t like not being the center of attention with her friends and I apparently drew some attention from her. I still dig the frustrated energy of that song. Click Here to hear “Talk About Love” from Days Between Stationsby The Dangtrippers. Love Tractor – Around the Bend (LP, DB Recs, DB67, 1983)($4.99) This was another very cool find! Of course, this is where I’ll alienate some of the readers. I found out about Love Tractor due to the documentary Athens, GA Inside/Out about the music scene in Athens leading up to 1987– R.E.M. is just getting to be a big deal in college rock– it was released before Document with “The One I Love” on it– so the movie happens at an opportune time. Included in the movie is Love Tractor who perform a live version of “Pretty” from Around the Bend. The album is largely instrumental with some sparse vocals. I had Around the Bend on a double-cassette which included their debut self-titled album and the follow-up Until the Cows Come Home. I find their unique style to be pretty similar to Athens contemporaries Pylon. Click Here to listen to “Pretty” from Around the Bend by Love Tractor. I also bought a bag of 100 mylar LP bags for $20. I never seem to have enough of those. I could get these cheaper online from Bags Unlimited, but since I was thinking of it, I thought I’d buy them. As I was walking back to my car I happened to catch someone out of the corner of my eye– it was Chris Corsale from The Right Now sitting in a window of a sandwich shop playing acoustic guitar and singing! He was suprised to see me as well! So, I moved my car to a side street– which is free and doesn’t require a permit after 11AM. Then I came back to the restaurant and ate lunch hanging out with him in between sets. It was pretty cool– Chris has a pretty wide selection of covers he does and made for good lunchtime entertainment. A great coincidence that sort of made for a good wrap-up of the weekend. After lunch I made my way back to McCormick Place to pick Sherry up and head home. The Time to play b-sides archives for the lauries-planet-of-sound tag.